It’s that time again! 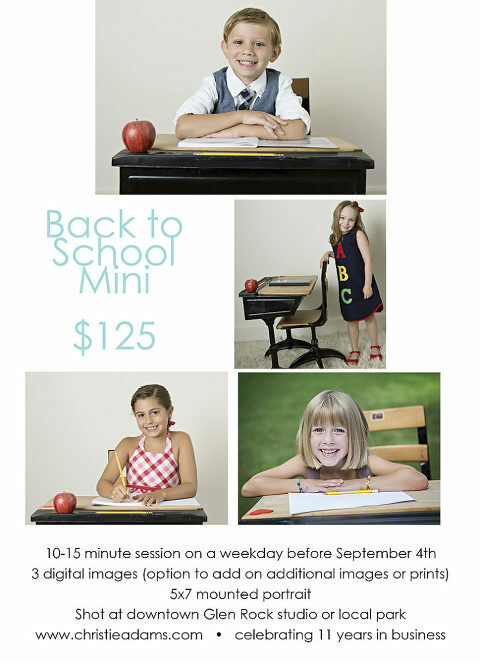 I am scheduling Back to School Mini sessions over the next 2 weeks at my Glen Rock studio (or the park behind my studio). These are always so fun and adorable since the kids are super excited to sit at my old fashioned school desk. I have them write their name in my marble notebook and of course have an apple to complete the look. I only save room for a few of these on my calendar so be sure to contact me asap to grab a spot before we go back to school on September 4th. Christie Adams Photography has been a Northern NJ children photographer for the past 11 years and has a studio in downtown Glen Rock in Bergen County. Christie specializes in timeless and classic portraits and avoids over-the-top props or backdrops which can quickly date your photos. Instead, with minimal props, your images will stand the test of time and look just as beautiful on display in your home decades from now as they do today.